Sort out propagation issues from Pre-Production to Production with slow rendering of Customer Portal. The portal is built using WebLogic Portal and runs the UCM as the content Management Repository. Improved performance of various parameters of the Portal such as Page Rendering, Propagation and Real Time Content editing. The Project also envisages building nearly 15-20 new features on the Portal. 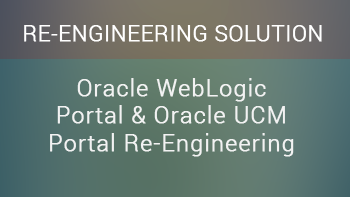 Solution leverages the strength of the Oracle platform to store and secure content in Oracle UCM and serves it up to end users through a portal view. Using industry best practices approach to WebLogic Portal and Oracle UCM, Nile leveraged personalization to display content in the portal view based on attributes of the consumer, allowing users to see the most pertinent content related to them. Editing for quick and intuitive in context contribution, creation and review. There are no disruptive experiences. This means that casual users easily take to the system allowing you to kill your learning curve. No expensive end-user training required. Query based and dynamic content display from Oracle UCM. Users are able to easily define what content from the Oracle UCM should display on each page, how it should look and how they want it to be personalized. This assists in their ability to recall where important knowledge is located. It also boosts the precision of searching and navigation by pulling the most relevant information into the user experience at the right time. Industry Standard Propagation Approach reduces the Propagation timeline. Reduces Image sizes to reduce portal rendering time.